As you're making your holiday gift list for yourself and thinking about what to get for friends and family, don't forget about your favorite surf racks and surf accessories! We've got plenty of gift ideas for surfers (and for paddleboarders, too) that can earn you good holiday cheer, and maybe even time under the mistletoe. Naked Surf Rack: this is one of our most popular surfboard storage racks, and for good reason. 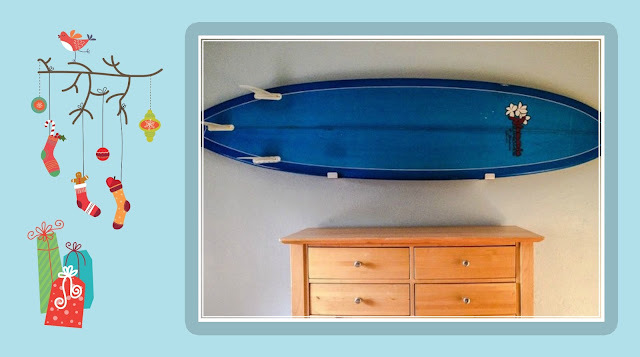 The rack has such a low profile that all you'll see is your surfboard stored "naked" against the wall of your bedroom, family room, or garage. No complicated installation or tricks to rack your board, just rest it in the arms and pull it out when the swell hits. 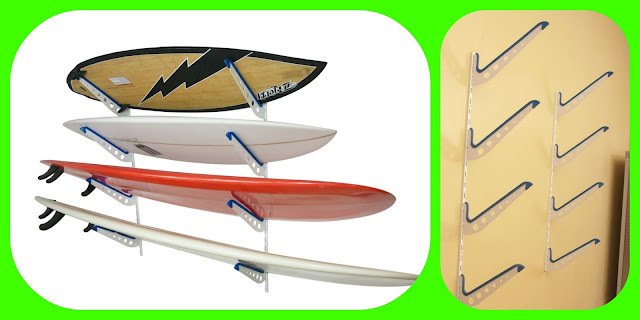 Multi Surfboard Storage Rack: if you've got a multi-surfboard quiver, you'll need this rack to store all your boards. The standard rack holds 4 surfboards, but you can buy additional arms and customize their spacing for more boards, or boards with fins in or out. Space the arms at the length you need, too, to accommodate whatever size boards you have. Get your surfboards in a rack to help keep them in top riding condition! Surfboard Carrier Strap Bag: This surfboard "bag" is the best of all worlds for surfboard bags. It's got all the functionality of a bag - surfboard carrier, pockets for gear - but saves you the extra weight and bulk of a huge bag. Great for day trips and for destination trips where you need to pack light! Easy velcro in and out for up to 2 surfboards. 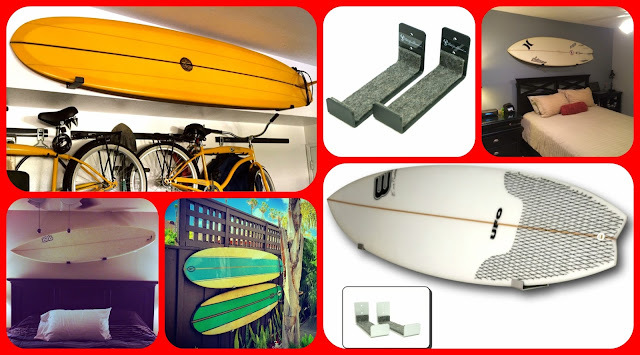 Surfboard Rail Protectors: Going on a surf trip this holiday season? Break out your heavy duty surfboard bags, but don't forget to add your rail protectors to your surfboards! You'll thank us when you get home with your surfboards in 1 piece and free of dings and damage from luggage handlers at the airport (scrooges!). The rail protectors are made from eco-friendly recyclable materials.